Viktor Orban at Plenary session of EPP Congress in Madrid, 2015. Demotix/Czuko Williams.All rights reserved.Devastating terrorist attacks, months of insecurity about the Eurozone, huge electoral victories for populist parties, an unprecedented refugees crisis... there is no doubt that 2015 was Europe’s annus horribilis. Both the projects of the European Union and of European liberal democracy were challenged in ways we have not seen before. The real question for the coming year(s) is: was 2015 just a freak year, soon to be forgotten, or a transformative year, shaping European politics for years to come? What stands out in both crises is the complete ideological vacuum at the heart of the European political elite. What stands out in both crises is the complete ideological vacuum at the heart of the European political elite. No one was really able to make a convincing defense of the fundamental values of the neoliberal austerity policies during the negotiations with Greece. In the end, the conflict was decided by the practical competence and experience of the Eurozone elite and, even more so, the incompetence of the left populist alternative – blinded by the moral imperative of its case and the narcissism of its ministers. Unfortunately, the situation with regard to the refugees crisis is different. Not only is the ideological vacuum even more pronounced, there is a much more powerful ideological challenger. Despite the striking national and regional electoral victories of the usual suspects of the far right – mostly established far right parties like the Austrian Freedom Party (FPÖ), the Danish People’s Party (DF) and the French National Front (FN) – the leader of the far right challenge has been a politician from Europe’s political mainstream: Hungarian Prime Minister Viktor Orbán. In many ways, 2015 is defined by Orbán’s transformation from political outcast to political savior. In many ways, 2015 is defined by Orbán’s transformation from political outcast to political savior. When the Hungarian premier used the terrorist attack on Charlie Hebdo in January to attack Europe’s embrace of multiculturalism, condemnation was almost universal – with the predictable exception of the European far right. 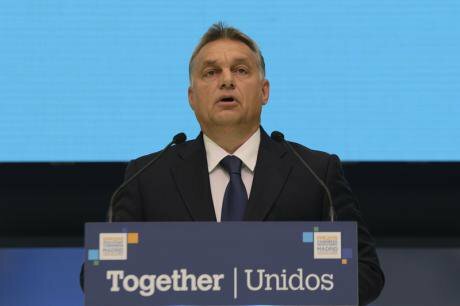 But when Orbán declared that he wants to preserve, “Europe for the Europeans and a “Hungarian Hungary” at the start of the refugees crisis, few EU elites were there to condemn him. And when he spoke at the Madrid Congress of the European People’s Party (EPP), equating the “immigrants” with “an army”, he was met with great applause. And that was even before the Paris attacks of November! The coming year(s) will have to show whether the European liberal democratic parties can still offer an alternative to Orbán. Merkel tried, defending a Europe open to refugees (if strict on immigrants), but found few supporters among other European leaders, and even vocal opponents within her own party. At the same time, Orbán was echoed by political leaders throughout East Central Europe, from Czech president Miloš Zeman to Slovak premier Robert Fico, and was recently joined in his open attack on liberal democracy in Europe by the new Law and Justice (PiS) government in Poland. Perhaps the clumsy policies of the new Polish government could trigger a center right response, given that the PiS is not protected by EPP membership, but it will look hypocritical if it doesn’t also target Orbán’s Hungary, and it will remain without any long-term effects if it is not rooted in a strong, rejuvenated, liberal democratic ideology.